From left to right: Dunkin’ Donuts Franchisee Parvez Sharifipour; Dunkin’ Donuts Franchisee Carlos Teixeira; Dunkin’ Donuts Integrated Marketing Manager Eric Stensland; and Regional Food Bank of Northeastern New York Executive Director Mark Quandt. 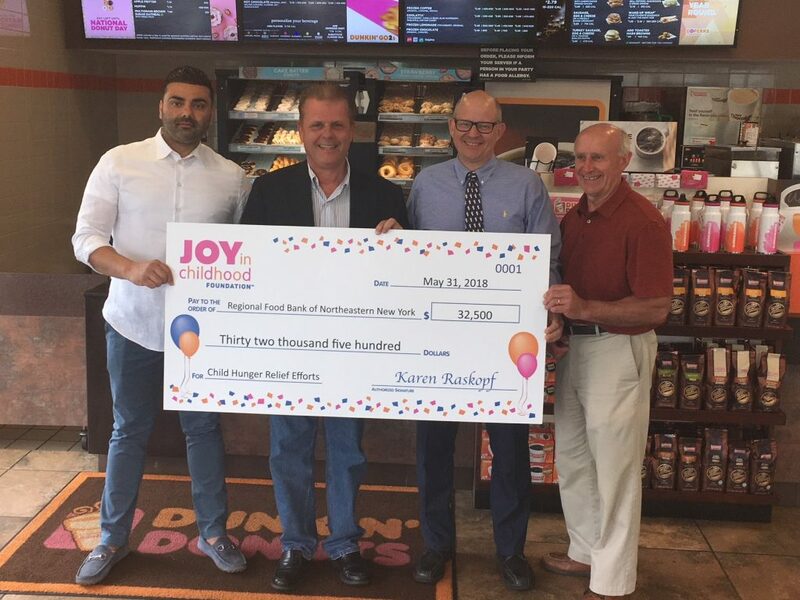 ALBANY, NEW YORK; – Regional Food Bank of Northeastern New York today announced that it has received a $32,500 grant from the Joy in Childhood Foundation, the charitable foundation supported by Dunkin’ Donuts and Baskin-Robbins. Regional Food Bank of Northeastern New York is one of nearly 20 Feeding America® member food banks to receive funding from the Joy in Childhood Foundation as part of a $1.5 million commitment over three years to support child hunger relief efforts nationwide. In the food bank’s 23 county service area, there are approximately 110,000 children who face hunger. The grant from the Joy in Childhood Foundation will support the Retail Store Donation Program, which allows the food bank to pick up donations daily from local grocery stores. The Retail Store Donation Program is the greatest source of meat and dairy products, which are two food groups essential for a healthy diet for children of all ages. “The Joy in Childhood Foundation is proud to support local food banks such as the Regional Food Bank of Northeastern New York that share our commitment to bringing joy to kids and helping them live healthier lives,” said Karen Raskopf, Co-Chair of the Joy in Childhood Foundation. To date, the Joy in Childhood Foundation has awarded $67,500 to the Regional Food Bank of Northeastern New York to help address child hunger issues in the Capital Region. The Joy in Childhood Foundation has had a longstanding partnership with Feeding America and has made a positive impact on the lives of those living with hunger for the past 11 years by providing $5 million in grants made to local food banks such as Regional Food Bank of Northeastern New York in support of children and families struggling with hunger in communities nationwide. The grant announcement comes just one day before Dunkin’ Donuts celebrates the return of National Donut Day to the Capital Region. On Friday, June 1, Dunkin’ Donuts will once again offer guests a free classic donut of their choice (while supplies last) with the purchase of any beverage. The offer is good all day on June 1 at participating Dunkin’ Donuts restaurants in the Capital Region on classic donut favorites including Boston Kreme, Glazed, Glazed Chocolate and Strawberry Frosted with Sprinkles. To learn more about the Joy in Childhood Foundation, please visit www.dunkinbrands.com/foundation or follow us on Facebook www.facebook.com/JoyinChildhoodFoundation. The Joy in Childhood Foundation, the charitable foundation supported by Dunkin’ Donuts and Baskin-Robbins, provides the simple joys of childhood to kids facing health and hunger issues. The Foundation brings together a wide range of stakeholders — including franchisees, crew members, employees, partners and guests — and partners with food banks, children’s hospitals, and nonprofit organizations directly committed to serving kids to fund joyful environments, joyful experiences and joyful expressions to ensure that children whose lives are compromised by hunger or sickness have the support and essential services to find joy in their daily lives. Since launching in 2006, the Joy in Childhood Foundation has granted more than $16 million to hundreds of national and local charities across the country. Feeding America is the largest hunger-relief organization in the United States. Through a network of 200 food banks and 60,000 food pantries and meal programs, we provide meals to more than 46 million people each year. Feeding America also supports programs that prevent food waste and improve food security among the people we serve; educates the public about the problem of hunger; and advocates for legislation that protects people from going hungry. Individuals, charities, businesses and government all have a role in ending hunger. Donate. Volunteer. Advocate. Educate. Together we can solve hunger. Visit www.feedingamerica.org. The Regional Food Bank of Northeastern New York is a 501(c)(3) not-for-profit organization that collects donated food from the food industry and distributes it to more than 1,000 charitable agencies feeding the hungry in 23 counties of northeastern New York. The food provided by the Regional Food Bank helps to feed over 40,000 people each week. In 2017, the organization distributed 38 million pounds of food to the hungry. The Regional Food Bank is a member of Feeding America. The organization is supported by foundations, private contributions and fundraising events. For information on services offered by the Regional Food Bank, call (518) 786-3691 or log on to www.regionalfoodbank.net.